That's your lot for today. We'll be back at 11:30 GMT on Saturday for third practice so hopefully see you then. Thanks for joining us and for all your comments on Formula 1's nice guys. Back tomorrow. Goodbye. 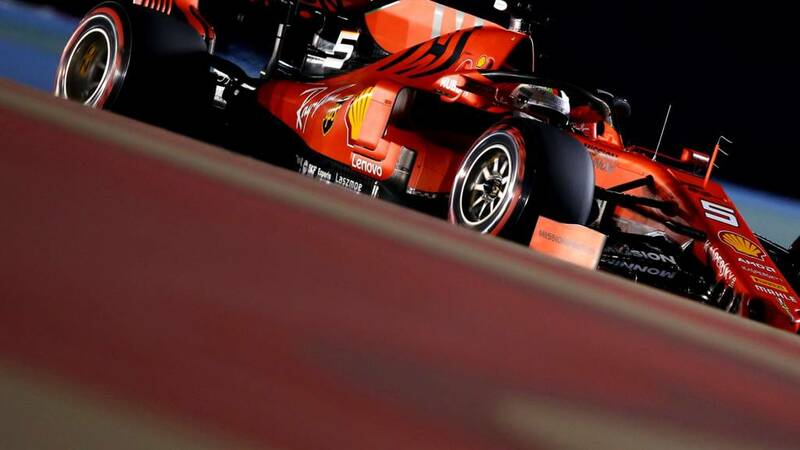 Ferrari appear to be back on form in Formula 1 after dominating Friday practice at the Bahrain Grand Prix. The Italian team struggled at the season-opening Australian Grand Prix, finishing nearly a minute behind race-winner Valtteri Bottas' Mercedes. But Sebastian Vettel headed Charles Leclerc to a one-two in Friday second practice, 0.603 seconds ahead of Lewis Hamilton's Mercedes. Leclerc topped the first session ahead of Vettel, nearly a second clear of Bottas. Unusually, Ferrari did a second qualifying simulation run in second practice, Vettel and Leclerc both improving marginally over their first lap. Vettel extended his advantage over Hamilton by 0.1secs, and Leclerc, who had been 0.141secs slower than Vettel on his first run, reduced the gap to his team-mate to just 0.035secs. Williams, as they have been all season so far, are struggling again. But they're trying to look at the positives. Ferrari were fastest in FP1 with Charles Leclerc ahead of Sebastian Vettel, now the order has switched but once again it is a Ferrari one-two. Mercedes third and fourth quickest, just as they were earlier on today, again the order switches around as Bottas was third earlier on, now it's Hamilton. Nico Hulkenberg of Renault with a stunning performance to come fifth, a full second faster than team-mate Daniel Riccardo who is 15th. Lewis Hamilton has clearly had enough. "Can I box, this is engine mileage for no reason," he says. He's told to stay out there for one more lap. Lando Norris is eighth today, but his mechanics need to check out his car. Giovinazzi was 18th, he's still there. A late attempt for a quick lap from Alfa Romeo's Antonio Giovinazzi. Who are Formula 1's nice guys and why? Billy: #bbcf1 doing a nice guys in F1 feature its got to be @danielricciardo surely. Can't imagine @KevinMagnussen finishing high in this though. The Ferrari pair of Sebastian Vettel and Charles Leclerc have been the quickest today, but a tip of the hat to Nico Hulkenberg who still sits fifth. Anyone from outside the Big Three teams jumping into the top six is always something to enjoy. It's a tricky turn at Turn Two and when the rear tyres go, they go, it's so difficult to catch it. People think it's a nothing corner, but the exit is so important. Well, just as I was saying that, Sebastian Vettel has spun at turn two. A huge plume of smoke as he just about keeps it out of the gravel and he has not done those soft tyres much good. It's an all-Ferrari kind of day. "I nearly got torpedoed," says Lewis Hamilton, desperately trying to stay out of Daniil Kvyat's reach. What of McLaren? Well, encouraging. Neither man got in the points in Australia, with Carlos Sainz not even finishing, but Lando Norris, who did at least get into Q3 last time out, is eighth quickest in FP2, with Sainz 11th. Some news of Williams. Sadly, once again, they are the bottom two. Robert Kubica was even lapped by his team-mate George Russell in Australia and sadly the Pole's return to Formula 1 for the first time since 2010 after a horrific crash is not proving to be the fairy tale everyone hoped it would be. Kubica is 20th, but a full second slower than Russell in 19th. F1 at night. Always looks stunning. Gideon Cresswell: I used to work with Lewis Hamilton at Bedford Autodrome around 15 years ago. He was a nice guy - even if he used to have the annoying Crazy Frog ringtone on his phone! Never got his autograph though! Lance Stroll bounces around over a kerb. He's down in 17th, four tenths slower than his Racing Point team-mate Sergio Perez in 14th. The Canadian also clipped a wall earlier on today, so he's had better days. Ferrari will be worse in FP3 as they have used their tyres now. But they've done it at a time closer in the day compared to when qualifying is.